Thanks you two..this made me nuts. nice draw by the way, maybe you could draw a face to Lt Johnson? Lol... thanks Javier... I was considering doing a MiG 15.. Might do...The Stuka is a tough one..hmmmmm B52..maybe..
Great details and very realistic :) Good job. r u sure it aint a pic??? its awesssssome!!! Nice job on this one... in a way it almost looks like a toy. Wo---ow! Super FX, Poppa. Everything works wonderful well in this. I especially like the metal part (brushed aluminium? Titanium? I dunno. What would it be?) Whatever it is, it's perfect. In fact, all the different finishes and textures look terrific. This should be in a book for plane enthusiasts. Dave, I'm not trying to be a jerk, (believe it or not). But listen, the perspective on the wings is way off. The right wing and stabilizer should be much smaller because they are further away than the left. Also the wingtips should be lower and further back in relation to the fuselage. The metal looks nice but the perspective is driving me nuts. Here is a ref to illustrate what I mean. 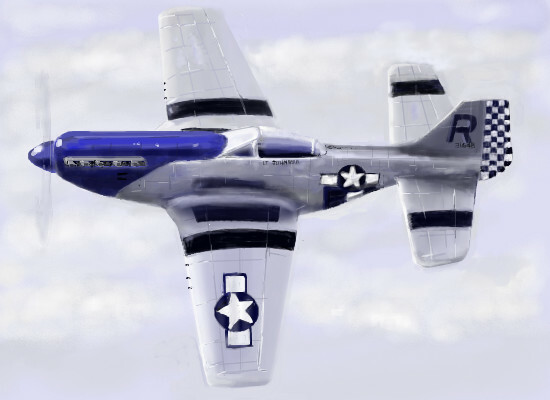 P51 D . I don't know if anyone else noticed and didn't want to mention the elephant in the corner or not, but...yea. Wow, that ref is a trip. the tail in the ref looks bent. Considering the ref, I'd say you were much closer than I thought. imagine a straight line from the front of the left wingtip to the front of the right wingtip. See how that makes the right wingtip look too far forward? Same with the horizontal stab. Wowzors! This owns! I like it, yeeah! You do these so well, not a huge army buff but you make these destructive machines look... noble. well done davinci. have you ever done a p61? i think i may have asked you this before. I built a model of one of these one time (your looks alot better). I had no idea building models was so difficult *sheesh* by the time I was done there was superglue everywhere.